A powerful earthquake with a preliminary magnitude of 6.6 has rocked central Italy, sending already quake-damaged buildings crumbling after a week of tremors that have left thousands homeless. There were no immediate reports of injuries or death. Residents already rattled by a constant trembling of the earth rushed into piazzas and streets after being roused from bed by Sunday's 7:40 am quake. Nuns rushed out of their church in Norcia as the clock tower appeared about to crumble. "We are definitely seeing some damage [already]," journalist Seema Gupta, reporting from Rome, told Al Jazeera. "We are seeing images of smoke covered over buildings that have crumbled to the ground," she added. "Many are centuries-old buildings not built to modern standards." 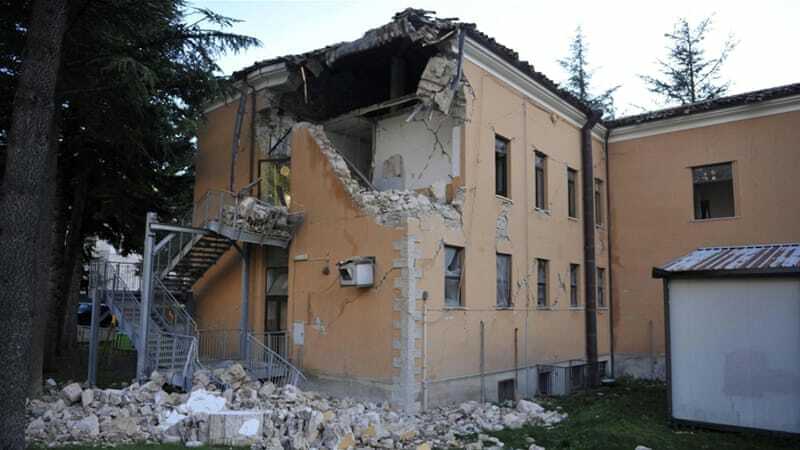 The quake measured 6.6 according to the US Geological Survey and was centred close to the Umbrian town of Norcia, where the historic Basilica of St. Benedict was badly damaged. The Survey also said the quake was centred 132 km northeast of Rome and 68 km east of Perugia, near the epicentre of last week's trembols. It reportedly had a depth of 1.5 km, a relatively shallow quake near the surface but in the norm for the quake-prone Apennine Mountain region. The earthquake was the biggest since almost 300 people were killed in central Italy on August 24 by a quake that levelled several small towns.